Louisiana is home to the largest shrimp fleet in the United States. Unfortunately, according to government estimates, this fleet kills upwards of tens of thousands of sea turtles every year that become inadvertently trapped in fishing nets and drown. 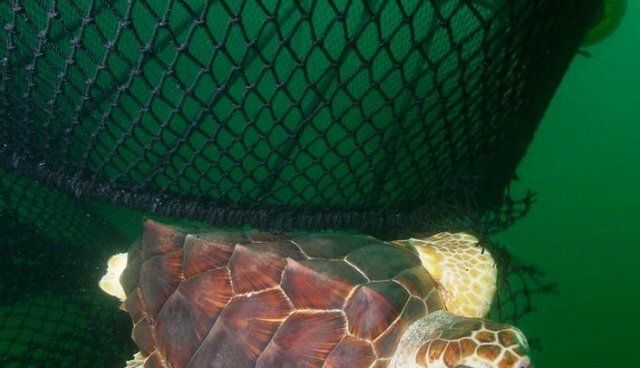 It is commonly accepted that one proven way fishermen can reduce the number of turtles trapped and killed is to install Turtle Excluder Devices, or TEDs, which are devices that create holes in fishing nets that allow trapped sea turtles to escape before they drown. Federal law requires most shrimp trawlers to use TEDs, and the law relies on both state and federal law enforcement agents to enforce this requirement on the water and at the docks. By state law, Louisiana is the only state that refuses to enforce this federal requirement, which is designed to protect threatened and endangered species. Last Wednesday, however, the Louisiana House Natural Resource Committee gave its approval to a bill that would repeal the 1987 law banning state officials from enforcing the use of TEDs, driven by the desire of the Louisiana shrimp fishermen to improve the conservation rating of Louisiana shrimp. Louisiana is currently the only state that is "red-listed" on the popular Monterey Bay Aquarium Seafood Guide, which puts Louisiana fishermen at a disadvantage relative to other US fishermen and other shrimp from around the world. Oceana is encouraged by the work of this Committee to tackle the longstanding issue of TEDs in shrimp trawls in Louisiana and bring the state in line with the rest of the nation. Shrimp trawling can be done responsibly using proven tools to minimize its effect on the other marine life that swim with shrimp. Responsible shrimp fisheries use TEDs, and enforcement of TEDs protects the work of honest, law-abiding fishermen across the state. Notably, the Louisiana shrimp industry itself has recognized these facts and asked for this bill to repeal the law, with a number of fishing industry representatives testifying at the committee meeting in favor of the bill. Shrimp catch is not significantly lower when TEDs are properly installed, and they are used safely across the shrimp fisheries of the Southeast region. Simply put, TEDs are a best practice and proven tool that is 97 percent effective at saving endangered sea turtles when used correctly. Oceana commends the Committee for its action to address this important issue. It will have proven benefits for Louisiana's fishermen and the sea turtles of the Gulf of Mexico as well as ensure that all Louisiana shrimp is safe, legally caught and good for the oceans. We encourage the Louisiana Legislature and Governor Jindal to support and pass the bill and do the right thing for his state's shrimp industry by passing it into law.